Begin by speaking to Herman Caranos at the Piscatoris Fishing Colony. Getting to the start point can be a bit tricky. The simplest way is to just cast the Eagles' Peak Lodestone spell and walk north. 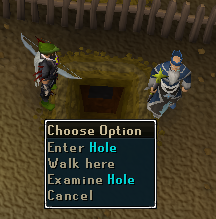 If you don't have this unlocked, go to the Gnome Stronghold. Exit it and go all the west, walking along the fence. Then go north, still walking along the fence. 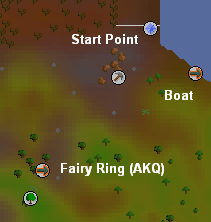 Tip: If you've completed the Fairy Tale Part 2: Cure a Queen Quest, you can use the Fairy Ring combination 'AKQ' to be teleported to a ring a short distance southwest of the start point. 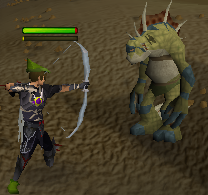 If you have a Spirit Kyatt, you can speak to it and choose the Teleport option to be teleported to the woodlands hunter area to the south of the Fishing Colony. From there, head a short distance northeast to the start location. Soon you will come to two people (looking like beggars). Ask them to go up north. Pay them 50gp and go. As soon as you get off the boat, you should see Herman Caranos near the fence and near a hole. Talk to him. He will tell that his fishing colony is being attacked by sea-dwelling trolls and they are feeding on monk fishes. Agree to help him. He will tell you to go to Wise Old Man. 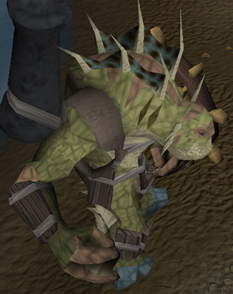 You will see the first cut scene and will see the Wise Old Man killing numerous high level monsters including the Kalphite Queen, Ogre Shamans and Dad. Go to the Wise old man in Draynor. Ask him for help and he will agree. He says that this will be his last adventure. He will ask for 5 blood runes, 10 lava runes and 10 mist runes before leaving. Give him the runes, and he will meet you at the colony. Head back to the colony making sure you have 5 Iron Bars, 1 Log, a Hammer and some combat equipment. Wise old man will be where Herman was. He will tell you to enter the colony. Go in the hole. Here you will fight six level 90 Sea Trolls Be prepared. A cut scene will occur, with the Old Man fighting with you! Once you kill them go inside and look for Herman. Talk to Franklin in front of the gate, and he will tell you that Herman is on the east side of the colony. You will ask for a reward now, but not yet. Herman will tell you to help out his brother, Franklin, and Arnold. Now go back to Franklin, and he will tell you that trolls smashed the western wall of the colony. He will ask for 5 sheets of iron to patch it. Go to the furnace room, right beside him and use your log on the Heavy Metal Press. Light the firebox with your tinderbox. Now put in your iron bars. They will be turned into Iron sheets. Now to fix the broken sections. Go all the west, and use your sheets on the broken wall. All 5 walls, should be beside each other. After head back to Frank to finish it up. Now for Arnold. Go to the general store where you will find him. He will tell you that they are out of food, and to fish for 5 fresh Monkfish in the North-west corner with a net that he will give to you. 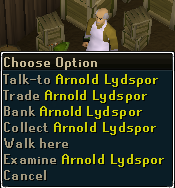 Note: Arnold will not accept old fishes! 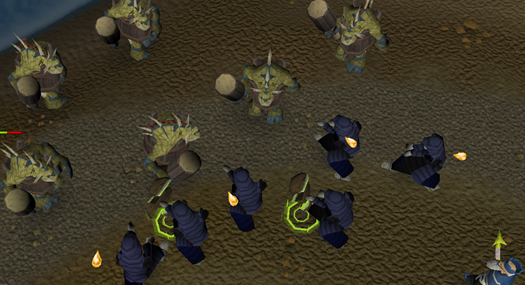 Start fishing at the fishing spot, and while you're fishing, sea trolls (80, 110, and 120) will attack you. After you catch 5-7 Monkfish, go to the range in south west corner, and start cooking. Of course, you may burn some so be sure to catch a few extra just in case, or go back, fish for a few more, and cook them until you have 5. After you cook them all go back to Arnold and he will thank you. Head back to Herman, who (along with the Old Man) now has a plan. It is to gather up all their forces and to have a large battle. Problem is their army is on vacation! So we have to gather them up now. 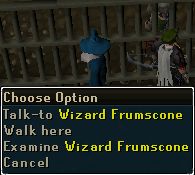 They will tell you to go see Wizard Frumscone in Yanille. Go to Yanille. Go to the basement of the Magic Guild with zombies and you should see him. He will say he can't lend you his zombies. He will tell you that he knows a man who is a necromancer. Agree to go to the necromancer. He will tell you to speak to Malignius Mortifier, found south of Falador. Malignius can be found just south of air temple where you'll find elemental wizards. Talk to him when you find him. He will agree to help. He will ask for 7 normal bones. Give them to him. He will say you need something to carry bone seeds in. He will tell you to go to Crafting Guild and will give you a brown apron to enter. Once in the crafting guild, talk to the Young Master Crafter in the North-East corner of the ground floor. He will tell you that you need a pot with a lid. Also, he will tell you to chill out. Back to the necromancer. He will put the seeds in your pot and seal them. Then he will teleport you to the colony. Warning: Do not go without food or armor! Go inside the hole and through the gate to Herman. 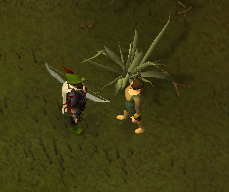 Give the bone seeds to Herman, and you'll be given a final chance to get any combat equipment you may need. Then you will be asked to fight, so be ready! 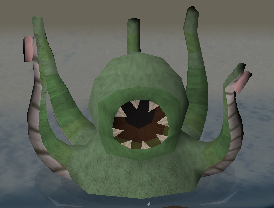 Warning: if you're in ranged combat with prayer on, this beast will drain your Prayer Points, so be careful! After you kill the monster, you can see people there and skeleton mages. Go back to Herman to get your reward. 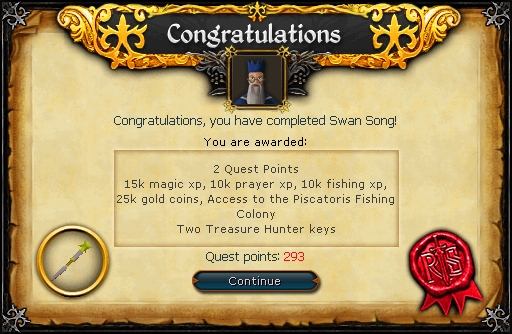 During the quest, you must fish and cook Monkfish. You notice you burn alot and takes a long time to fish not depending on your level. You also noticed if you ate one, it only healed 200 Life Points. After the quest is finished, you can fish and cook monkfish depending on your Cooking and Fishing level. Monkfish will then heal 1200 Life Points.